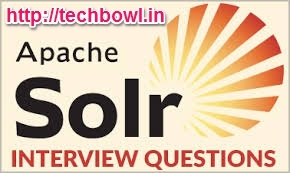 Solr is an open source enterprise search platform, written in Java, from the Apache Lucene project. Its major features include full-text search, hit highlighting, faceted search, real-time indexing, dynamic clustering, database integration, NoSQL features and rich document (e.g., Word, PDF) handling. Providing distributed search and index replication, Solr is designed for scalability and fault tolerance.Solr is the second-most popular enterprise search engine after Elasticsearch. What is the use of field type? What all information is specified in field type? • If the field type is Text Field , a description of the field analysis for the field type. Name different types of highlighters? • Standard Highlighter: provides precise matches even for advanced queryparsers. • FastVector Highlighter: Though less advanced than Standard Highlighter, it works better for more languages and supports Unicode breakiterators. • Postings Highlighter: Much more precise, efficient and compact than the above vector one but inappropriate for a more number of query terms. What is the use of stats.field? What command is used to see how to use the bin/Solr script? Which syntax is used to stop Solr? Which command is used to start Solr in foreground? What data is specified by Schema? Name the basic Field types in Solr.